The Giants came into the rubber match of the three-game series with the best performing bullpen in the league. The Dodgers bullpen, on the other hand, had struggled mightily. Thankfully, the Dodgers flipped the script tonight with clutch hits from Enrique Hernandez, Cody Bellinger and David Freese. Ross Stripling had a rough 4th inning, but kept them in the game. The L.A. bullpen was the difference maker, with 2.2 innings of scoreless ball. Then again, Joe Kelly wasn’t anywhere near this game. Enrique Hernandez, lead-off hitter, wasted no time today. He crushed his third home run of the season, a shot to left-center field off lefty Derek Holland to open the bottom of the first. First time in franchise history the Dodgers have homered in the first seven games of the season. Costly consecutive walks to Freese and Corey Seager allowed the hottest hitter in the league, Bellinger, to come up to the plate. Bellinger came through with an RBI single to give the Dodgers an early 2-0 lead. Freese somehow avoided Erik Kratz‘s tag at the plate. It was an aggressive send by Dino Ebel that almost didn’t work out, but Bruce Bochy didn’t challenge. Meanwhile, Stripling was pitching well and efficiently until the bottom of the fourth. The Giants took a 3-2 lead off two home runs, the first runs allowed by Stripling this season. Steven Duggar‘s first home run of the season for the Giants, a solo homer to lead off the fourth, cut San Francisco’s deficit to one. Then Brandon Belt crushed a flat Stripling slider for a two-run homer. The damage in the inning could have been worse, but the momentum changed when Kevin Pillar was called out on batter’s interference. He ran too far inside the first-base path and got in the way of Freese, who bobbled the ball. The Giants loaded the bases, but Stripling managed to retire Holland on a fly ball to left to end the inning. Switching back to offense, Kiké Hernandez is unstoppable. From @DodgersPR: Kiké Hernández has hit safely in his last 10 games, dating back to September 28… batting .513 (20-for-39) during that span. 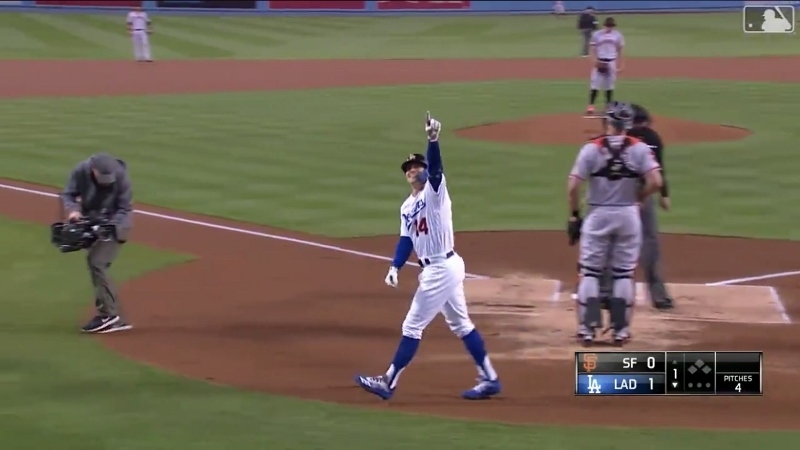 In his second at-bat vs. Holland, Kiké doubled to left with one out in the 5th. Unfortunately, Justin Turner hasn’t looked as locked in as he did during spring training. He struck out a third time against Holland, the second out of the frame. Freese walked to extend the inning, but Seager grounded into a force to close out Holland’s night. Holland’s line: 5 IP, 2 R, 3 H, 7 K, 4 BB, 98 pitches (61 strikes). The Dodgers weren’t able to gain any traction against Holland after the first inning, and the San Francisco bullpen came into the game leading the NL with a 1.50 ERA. The Dodgers were 11th (6.84). Right-handed reliever Sam Dyson came into the game in relief of Holland and pitched a 1-2-3 frame in the 6th. On the other side, Stripling only made seven pitches in the 6th, so he was back out there to start the 7th. Dave Roberts went to the pen after Stripling retired Kratz for the first out, bringing in Scott Alexander to face Pablo Sandoval. He retired Panda and then struck out Duggar to end the inning. Stripling’s final line: 6.1 IP, 3 R, 6 H, 3 K, 1 BB, 87 pitches (61 strikes). Kiké walked, and Turner flied out to right. Fortunately, Kiké tagged up, and the Dodgers had runners at the corners with two outs. Interestingly, Roberts went with Freese to face Moronta over Joc Pederson or Max Muncy, lefties still left on the bench. A bit unsurprisingly, Freese came up huge with a clutch two-run double to give the Dodgers back the lead. Roberts is a genius! Now nursing a one-run lead, Caleb Ferguson continued to impress, and he sent the Giants down in order in the eighth. The Dodgers then expanded their lead in the bottom of the eighth against Tony Watson. Bellinger hustled down the line, demonstrating just how fast he is, and legged out a single on a ground ball to second. Then he flew around the bases on a Taylor line-drive double to put L.A. in front 5-3. Kenley Jansen came in and closed it out in the 9th, a much better relief appearance for the big guy than last night. His cutter looked much better, and he even threw a slider. He induced a game-ending ground out from Gerardo Parra, a great way to seal the win. The Dodgers improve to 5-2 as they wrap up their first homestand, winning both of the first two series of the season. The Dodgers get an off day Thursday as they head out on their first road trip of the season. They’ll try to survive three games at Coors Field then head to St. Louis for a four-game set against Paul Goldschmidt and the Cardinals. Friday’s game, the Rockies’ home opener, starts at 1:10 PM PST/4:10 PM EST. Kenta Maeda (1-0, 4.05 ERA, 7.86 FIP) takes on Tyler Anderson (0-1, 9.00 ERA, 1.71 FIP).